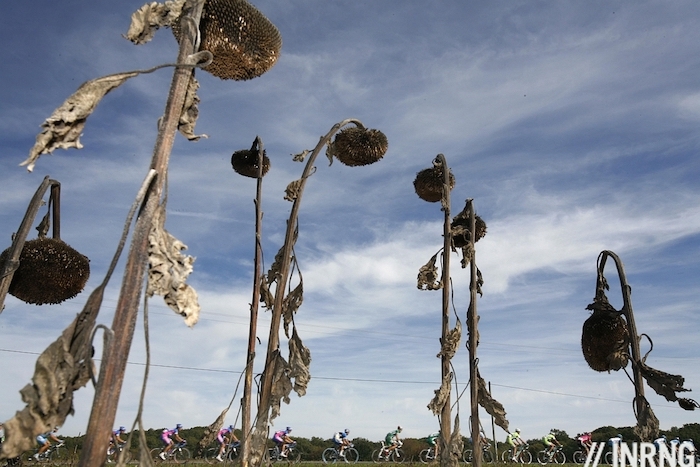 Just as the last remaining sunflowers await harvest there’s one more classic at stake. A classic with a small “c”, Paris-Tours has a long history and some big winners but doesn’t enjoy the same status today sitting outside of the UCI’s World Tour. Nevermind the UCI’s label this race consistently offers a lively finale, a tense battle between between the breakaway and the sprinters. The Route: back to normal of sorts after last year’s course abandoned the late climbs in order to offer the sprinters a dress rehearsal ahead of the World Championships in Doha and now the lively finish is back. The start varies – “Paris” is a conceit – and this year’s départ is in Brou, 130km from Paris and a small town with a population 3,400. Perhaps the race is the biggest thing to happen all year here? Or even in the decade? After heading north-east the race curls back and heads south towards the Loire valley and Tours across a flat landscape occupied by large farms with plenty of exposed roads. The profile hardly shows it but are three climbs near the end of the race that, if not high, are highly strategic. As well as these climbs the race uses narrow roads that twist and turn and after five hours of racing riders have to keep their wits about them and fight for position. The Finish: once upon a time the Avenue de Grammont in Tours was an endless road, the world’s longest finishing straight. But municipal meddling put a tramway in town. Nevertheless the finishing straight is 800m long, plenty of time for a big sprint. As the map above shows the race snakes its way into town and this makes it hard to control. With 5km to go things open up and note the sharp turn with 800m to go. The Scenario: an early breakaway should go and it’s often packed with the desperate who are still hunting a contract for next tear. Several teams have an interest to set up a sprint so we should see any escapes controlled but with 30km to go things get open as the twisty route and sharp climbs encourage attacks and there’s a delicate balance between using your team to control the early break and saving riders for the tricky finale. Fortune favours the brave. Ever since the race moved to the Avenue de Grammont in Tours in 1988, famous as a sprint arrival, it turns out 18 finishes have seen breakaways win versus 11 bunch sprints. Quick Step hold the key to the race. They come with a versatile team capable of playing strong cards for both the late breakaway and the sprint. Fernando Gaviria won last year and is an obvious pick again, he proved in the Giro he can sprint with the best and he’s form is good, he was with the front group in Bergen. 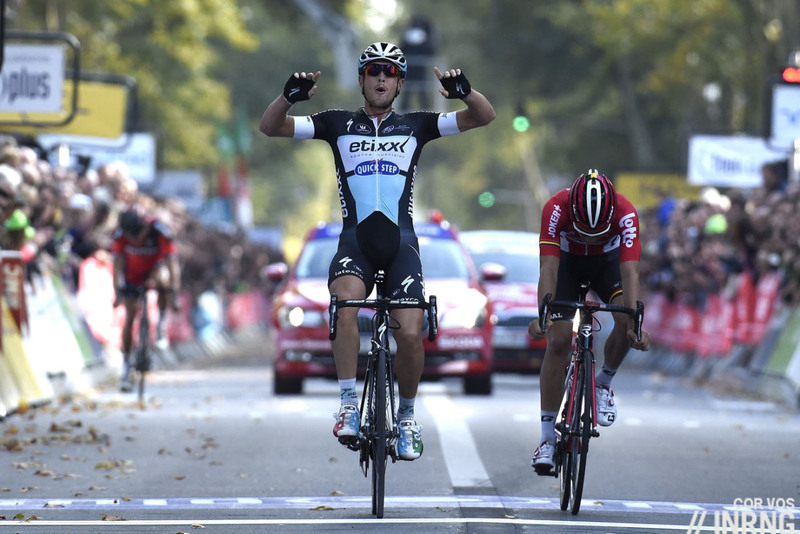 Meanwhile Matteo Trentin won here in 2015 (pictured) and can either try the breakaway or offer a back-up plan for the breakaway. Meanwhile Niki Terpstra and Zdeněk Štybar are both in the hunt for a win this year, podium places in Tour of Flanders and Paris-Roubaix respectively but no big wins. Yves Lampaert, Rémi Cavagna and Iljo Keisse bring the power to help control things too. Nacer Bouhanni was on the attack a week ago in the Tour de Vendée, going solo in the final 20km before being caught and his leadout man Christophe Laporte went clear for the win. This says he’s confident and in shape to get over the hills in the finish. As ever he’s volatile but the real question is whether his Cofidis team have the horsepower to pull back a breakaway in the finish. André Greipel is back. After a long drought he won the Omloop Eurometropool the other day. Today is an altogether biggest test with the climbs but he should have what it takes and Lotto-Soudal bring a cohesive team with Jens Debusschere also capable of leading the sprint. 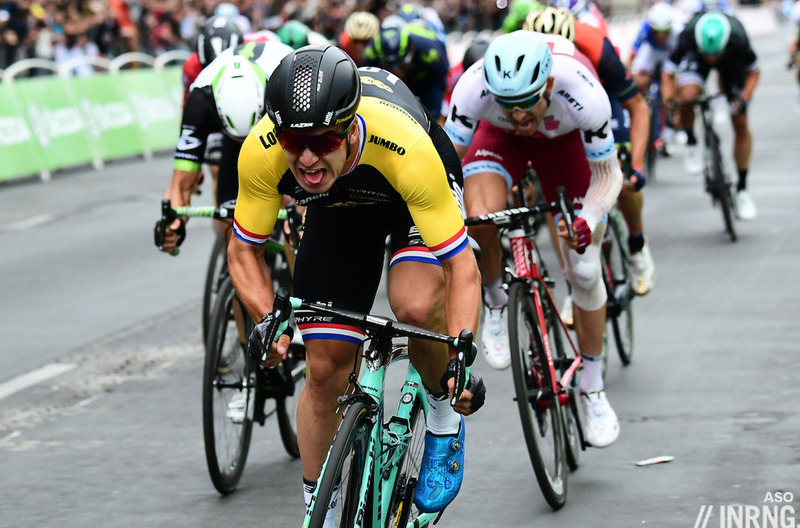 Dylan Groenewegen finally landed that big win on the Champs Elysées but he’s still an infrequent winner, a top rate sprinter but not someone you’d bet on to win regularly. Lotto-Jumbo also have J-J Lobato as a sprint Plan B. Team Sunweb have a German tandem in Phil Bauhaus and Max Walscheid with the former delivering the occasional win and the latter tipped as sprint royalty for the future. Ag2r La Mondiale will back their sprinter Rudy Barbier, the recent winner of Paris-Bourges. A useful signing this would still be an upset if he won today. FDJ’s Marc Sarreau was second in Bourges and another outsider but well supported by the likes of Lorenzo Manzin. Write Mark Cavendish off at your peril. He’s won everything a sprinter can win except for an Olympic gold medal, Gent-Wevelgem and Paris-Tours and now there’s a chance to fix this. But the form and the focus are the doubts and he’s not got a big train, Dimension Data are without a full quota of riders and start with two stagiaires but if he’s within range in the final kilometre he’s got the craft to do it. Weather: cloudy and calm with a top temperature of 17°C at the finish. TV: live on France 3 in France and Eurosport around much of the world. Coverage starts at 3.15pm CEST and the finish is forecast for 4.55pm. If you can’t watch it all, tune in for the final 30 minutes. 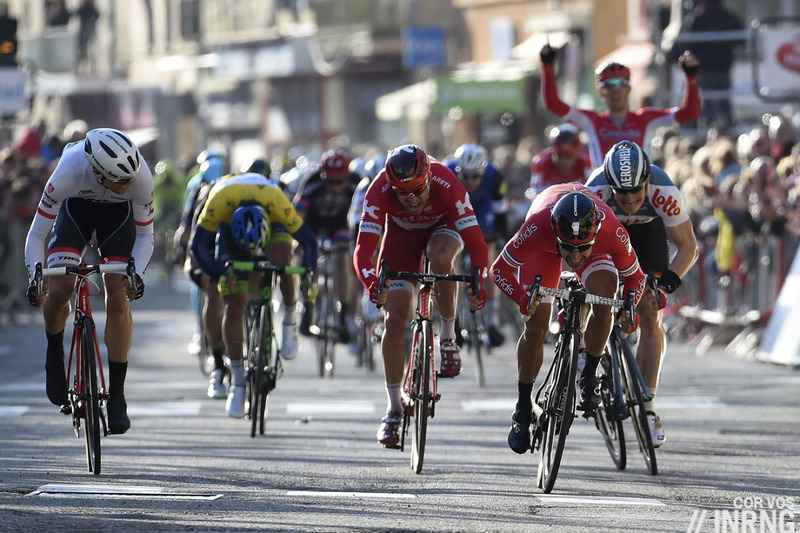 Quick Step first and daylight second after Alaphillippe misses out again, this time at Il Lombardia? Agree with Gaviria, especially as he should have enough support to dissuade him from getting involved late as he did at the Worlds, but I can’t see Bouhanni ahead of anyone rated two chainrings or better. Whatever happens it’s an interesting contrast to the hills of yesterday’s big race. Be good to see a fox clear of the hounds into the finishing straight, there seems to have been a few more successful very late escapes this year than in recent years. I’ve come to wonder at your fondness for this race, Inner Ring. Your top picture could tell a number of tales. You’ve oft lamented its demise whilst, at other times, its flat windswept northern French landscape has received a more critical narrative – be it a mid-Tour transition or an early stage of Paris-Nice? The landscape is boring, hardly a road to ride you’d dream about. Instead it’s the finish that’s great, the addition of the climbs late in the race has turned “the sprinters’ classic” into an exciting contest that’s made for TV, certainly most of the last few years have been thrillers. I promised I write some Paris-Tour inspired poetic words (as far as I can write „poetic“). So I do. I let it flow, so please bear with me (english isn‘t my first language, so being poetic in it isn‘t so easy and quite obviously, keeping it short isn‘t even any language of me. Well, it is as it is). Paris – Tours, my favourite race of the year. The Grand Prix d‘Automne, another victim of the fights between ASO and the uci. And so since 2008 it isn’t part of the „premium“ race calender any longer. On one side that is good, as it enjoys more freedom, on the other hand it is bad in our times of image driven PR. I fear new fans have no idea of this great race, just because it isn‘t in the world tour aka the idea of dumbing down cycling. The first Paris Tours was ridden in 1896. It is a strange feeling to think, that 100 years ago riders were readying themselves for this race, as the riders did today. That people talked 110 years ago of the chances of this or that rider, like we do today. It is a wondrous feeling, a precious feeling to be part of this continuum. It is our duty to guide and guard it, defend and appreciate it, so that in 100 years a person can say: It is a strange feeling to think, that 200 years ago riders were readying themselves for this race, as the riders did today. Paris-Tours was called Tours-Paris, Versailles-Tours, but my all time favourite is Grand Prix d‘Automne , the Grand Prix of autumn. Autumn is my time of the year. It is a time of change, where we say goodbye, with a sad smile, to the green grass, the merciless heat of the sun and the dusty roads. But it is a nice sadness, not a bitter one, because it is not a goodbye of forever, it is the promise of a new beginning. This is autumn to me: The promise, that life goes on, that the cycle has no end and we a place in it. It is bigger than us humans. It doesn’t care about us, it doesn‘t need us. A tree will grow, no matter if we exist or not. Leaves turn red, yellow and brown and shine in beautiful warmth, instilling in us the knowledge, that they will be part of us forever. Because the leaves of next year will be nurtured by them, the trees of next year will be stronger because of them. Autumn, the great teacher of humbleness. No matter how tall we think we are, for all of us comes the time, where we fade and return to the fabric of which we were made. Soothing autumn, the great teacher of togetherness and humbleness. No matter how independent we think we are, how much we deem ourselves superior, in the end we all are the same, bones and flesh. And not one of us can exist without all the other leaves on the trees and the ones before us, that nurtured us. I only came for today to this website, which I stopped reading/visiting some time ago, to say something in praise of this beautiful race, which seems to me alive like no other race. Maybe it is the sense of the nearing end, the season comes to a closure. Maybe it are the autumnal colors, the grass and the trees, the small roads, that look humanmade and used, as if they are part of life. Maybe it is, because the race is with the lifes of people, it passes houses, gardens and everyday life and isn’t removed from us on some distant mountain top or a faceless country road. Maybe it is all that and it combines itself with the human effort to something, that is more than „just another race“, just another repetition of the same thing: If you don’t win today, you can try it again tomorrow or next Monday – till it all blurs and loses it‘s meaning. That is why we have lighthouses like Paris Roubaix, the Tour de France or Il Lombardia, to distinguish one day from the other and give it meaning. For Paris-Tours we don’t need that. In these days of inflation, convenience and immediate rewards, it is rare to not get your way. You hear no „No“ and money can buy you everything. It is rare for an addiction to not get fed and even christmas isn’t sacred anymore for the premier league. It is fitting, no, it is right, that this autumn race defies that. An hommage to a time, where things had a meaning. After Paris-Tours it is over. And that is how it‘s supposed to be. But before it is over, we have one more shot at greatness. Today the riders can shine one last time, give it all in the knowledge, that they can collapse afterwards with the freedom of days without pressure before them. And shine is what so many did in this historic race: Gustave Danneels won Paris-Tours in 1934,1936 and 1937, which brought him the nickname Mijnheer Parijs-Tours. As I mentioned last year, Heiri Suter, one of 6 bike racing brothers, won in 1926 and 1927. The famously infamous Péllisier brothers both won this race, as did the first maillot jaune, who didn‘t like the jaune at all, Eugène Christoph. And the first man winning the Tour de France without being from France, François Faber, he also could win Paris-Tours twice. Every fastman tried to conquer it, but also hardmen like Briek Schotte and Sean Kelly left their traces and could sign their names into the winning list. As did the only man (as far as I know), who rode part of the Tour de France on a bike, which was made for women, because his own bike broke and still managed to win it, Nicolas Frantz. In short many of the greats of the cycling world won this race. But not the one, who did win almost everything else. The ones winning the race three times are Gustave Danneels, Guido Reybrouck, Paul Maye and Erik Zabel. But many won twice: Philippe Gilbert, Jo de Roo, Rik van Linden, Nicola Minali, Ludo Peeters for example. This shows how vital it was to the peloton. When Paris-Tours was on, you came. The best of the peloton met there. It was a fixture. Before marketing created the term „Monuments“ a few years ago, Paris-Tours was up there with the most prestigious races, the races a rider wanted to have on their palmares. It pains me, that the next generations of riders and fans probably will never feel this race as others could feel it, fall helplessly in love with it as I did, seduced by it’s modest everyday charme, which hides well it’s sophisticated reality. Gaviria’s win last year left me stunned and speechless for minutes. The beauty and flawless clarity of his win made it seem like there never was another outcome possible. It always had to be this way. The king came home. A lot of words, indeed, and a certain amount of redunancy in them. Like in nature. And yet not one word too many. I second everyone (even if I cannot claim to have a fraction of your familiarity and even intimacy with this race). You deserve to have a proper name or moniker – and it would be nice to have you back as a reader and commentator when the spring classics come! Thanks, appreciate it very much. It is one of the things I try to control in writing – closing in several times on things from a different angle, because I know, what adds another layer for me, often upsets the rhythm for other people. But I did it mostly on purpose this time, as you noticed. Of course I chose to focus on certain things of the race and it‘s history and ignored others in this post, the race is much more nice and not nice things than this, but a few years ago, when this race first became one of my favorites, I tried to find out, why exactly that happened and why, when it looks so mundane and unassuming, it moved me, when other races never come closer to my heart than „Yeah, the racing was great“. That is probably where the imtimacy comes from and I am happy, that it could be felt. Really pleased the hills are back at the end. Last years course felt neutered because of the World Champs set-up, in the same way as the Tour of Britain was this year. A third Quick Step win in as many years; 4 riders in the top 7. What can we do to tackle this monstrous control of a great race, pay them in onions, put a baguette basket on the front of their S Works Tarmacs? I’m being mischievous obviously but if artificial tweaking is made to influence race outcomes, where should it begin and end? To make it pretty simple: today was good cycling, the Tour de France isn’t, nor was it last year (and that hurt hard viewing figures, too). “Strangling the race” would have meant, say, keeping a moderate to high but not top pace until Gaviria was back in, while at the same time sending a man in every move with the mere function of sitting on the wheel to stop the break. Are you comparing a bad Tour with a fine Paris-Tours? Hey. Most would like if not expect it to be the other way around, if anything (good cycling everywhere is obviously the best option, and I love Paris-Tour): on the one hand, a supposed sprinter race, mainly flat, at the end of the season versus, OTOH, the big show. Well, the latter is big indeed but it’s been a poor show. Yeah, I saw your smiley above; nevertheless, I don’t think it’s smart to foster confusion: people – and I mean, “big” people, not just us – often debate about how to make cycling sustainable/profitable/economically viable with absurd proposals (often about TV, showing more often than not that they don’t know anything about televised cycling) while they tend to turn a blind eye on the elephant currently trampling the luxury parlor of the sport. Quickstep’s budget is probably *half* of Sky’s. Good for them if they’ve got the sporting qualities to make it count (or, better said, if they limit their sporting scope). Yes, they’re also a rich and powerful team – they’ve always been and they’ve always won thanks to that, among other things. But it’s about spending some 20% more than the majority of rival formations. It’s not about spending 2x, 3x or the likes, which is what Sky does. One of my favorite races of the year. Thanks for previewing, Mr. Inrng!